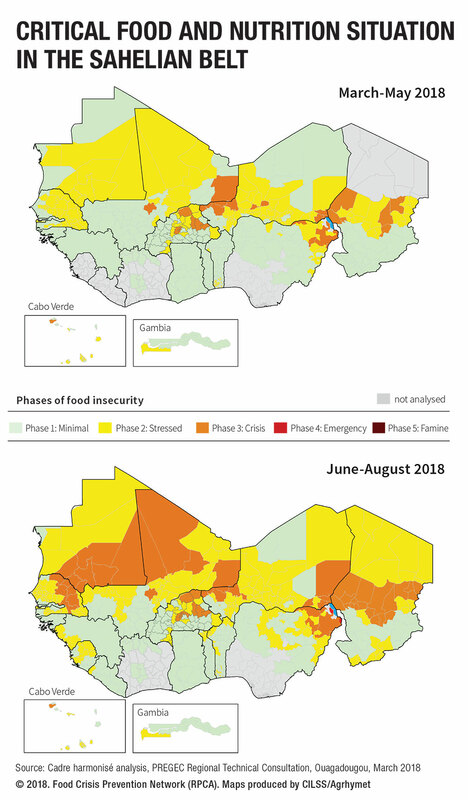 The food and nutrition situation is severely deteriorating in parts of the Sahelian belt. According to the Cadre harmonisé analysis, nearly 7.1 million people currently face a crisis situation, especially in zones that are still plagued by insecurity, including in the Lake Chad basin, the Liptako-Gourma region and central Mali. The number of people in need of assistance could reach 10.6 million by June-August 2018, if appropriate measures are not taken in time. While the food situation has improved in the northeastern states of Nigeria (Adamawa, Borno and Yobe) thanks to ongoing humanitarian interventions, Nigeria still accounts for more than 50% of the region’s food insecure people. About 3.7 million Nigerians currently require emergency assistance (March-May 2018). These figures are expected to increase to about 5.3 million people by June-August 2018. In Borno State alone, some 1.5 million people (27.8% of the population) are likely to face a crisis situation (phase 3-5). The situation is also set to become extremely difficult in Burkina Faso, Chad and Mali as each country will have to address the urgent needs of nearly 1 million people. Some 800 000 people may be food insecure in Niger by June-August. The majority of people in need of food and nutrition assistance in these areas are pastoralists and agro-pastoralists. Their communities have been severely affected this year by the lack of fodder and water and they have been forced to migrate early, with their livestock, to other areas within their countries or across national borders. The critical food and nutrition situation is also linked to the region’s sluggish economy, the depreciation of certain currencies and inflation, which create an untenable situation for the most vulnerable populations.